Did you know that Orange County Utilities Water Division provides a ton of resources for you and your irrigation system? Their Water Wise Program targets inefficiencies in the home and provides resources to help mitigate them. These resources come in the form of classes, free water saving devices or equipment, and publications made available for every homeowner. Orlando and the surrounding cities have a pretty great partner in Orange County Utilities for keeping their water bill low and making a difference in the environment where their water usage is concerned. Check with your county to see what programs they offer. Watering once a week through the fall and winter is sufficient for your landscape, but only if your system is able to work to its full potential. As always, it is our goal at Total Sprinkler and Lighting to make sure that your irrigation system is running efficiently. 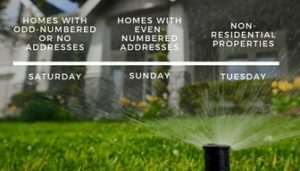 If you spot broken sprinklers, damaged lines causing water to bubble up, or if your timer is causing the system to come on outside of its normal cycle, please contact us.